Provides real-time counts of total and viable particles in pharmaceutical manufacturing environments to reduce aseptic interventions, improve root-cause investigations, and increase process knowledge. 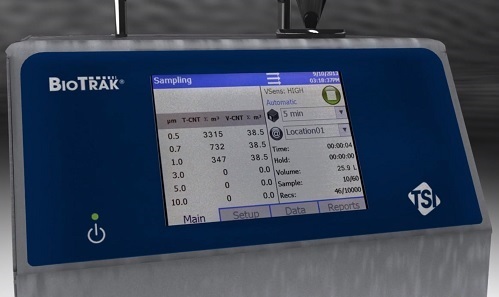 Truly isolate your aseptic process with the BioTrak® Real-Time Viable Particle Counter. It combines viable particle counting—also called biofluorescent particle counting (BFPC)—with sample capture capability and ISO-compliant total particle counting to offer a complete solution for pharmaceutical environmental monitoring. Superior discrimination between viable and inert particles delivers reliable viable particle data. Time-tested gelatin filter technology efficiently captures sampled microorganisms for subsequent identification. When combined with TSI FMS Software, it can be used for continuous monitoring of aseptic processes to reduce or eliminate environmental monitoring (EM) interventions, improve quality, and ensure data integrity. Used as a standalone instrument, it can quickly identify sources of contamination during EM investigations, provide data for immediate room release, and aid in the identification and mitigation of risk. Come and chat with Mike, Carol, or Patrick, our in-house experts, about TSI's reliable cleanroom monitoring instruments.